All you have to do is shop like you do each month for groceries, gas, eating out and other normal everyday purchases, at your normal retailers, and all we ask is that you pay for these items using gift cards ordered through St. George’s instead of using cash or your debit card at the register. Here is the link for order form and list of participating retailers. Just print it off and drop off at the church. Order forms and post dated cheques may be dropped off anytime up until each order date in the tray in the upper lobby. Many thanks for your support. Gift cards should be available one week after ordering. 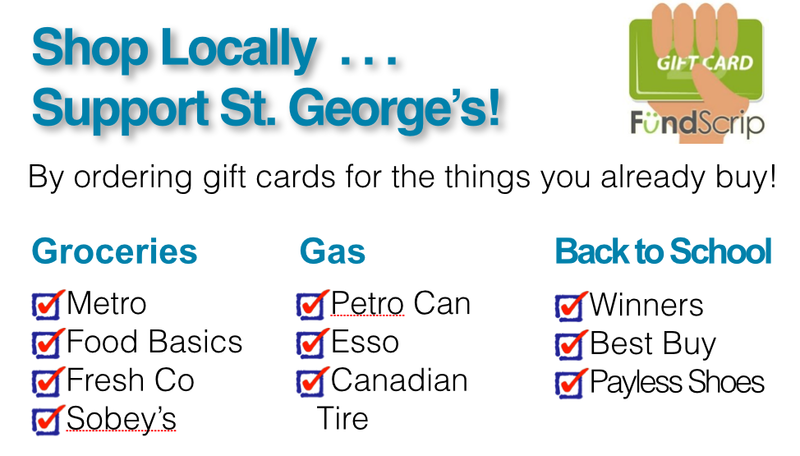 St. Georges receives a small percentage from every gift cards you order. If 50 families all participate in this project for a year, we can easily raise $10,000.